Otitis interna, also known as labyrinthitis, is an inner ear inflammation as a result of an infection. Ear infections are common when its affect the outer or middle ear, but when an infection of the inner ear occurs, you should take an immediate treatment to prevent complications. The inner ear regulate some importante system of our body, this organ consists of many structures for maintaining balance and supporting the hearing system, so an infection in this part of the ear can disrupt both functions. The expert wasn't clear what causes Otitis interna or labyrinthitis. It once was thought to be a result of viral infection, but less than half the time is this the case. It almost always goes away on its own without treatment. But in some instances, it causes permanent hearing loss. Pigeon Orchid can be found in tropical asia and pasific area in semi-deciduous and deciduous dry lowland forests and savana-like woodlands at an altitude of sealevel to 500 meters and grows as a small to large sized, hot to warm growing epiphyte with spindle shaped. inner Ear problem, especially affected by deep ear inflammation (internal otitis). Distilled the sap from the stems and tubers of the orchid, then drop a few drops on the sick ear. Garlic is a natural ingredient that can help heal pain or disturbances in the ear. The trick is crushed 5 cloves of garlic and then squeeze to get the extract. Then after that dab a little juice of garlic on the ear that is infected. This is because garlic contains to substances that kill bacteria in the ear. Do it every day to get maximum results. In addition to using garlic, you can also use tea tree oil. The trick is to dissolve tea tree oil into the water with the same ratio. After that drop the water on your sick ear. Tea tree oil serves to destroy bacteria and remove the fluid that accumulates in your ears. Traditional ear pain medicine then you can take advantage of orchid leaves and turmeric. Both of these ingredients are very effective in dealing with ear problems. To use it, prepare 3 pieces of orchid leaves and 1 segment of turmeric, smash and mix both materials, squeeze and take the extract. Then drop the extract on your aching ear as much as 3 drops. Do it regularly 3 times a day. Not only can solve the problem of beauty, olive oil can also overcome one of the health problem that that related to ear. How to use it, heat enough olive oil and then drop on the ear slowly. To speed up the healing process, use this olive oil regularly and regularly. The next earache traditional medicine is using wungu leaves. How to use it, take some wungu leaves then boiled with a little salt. Use this traditional herb regularly. This method proved very safe and effective to treat earache. In order to prevent the problem reappear, make sure you know how to clean the right ears. Wash all thebilly goat weed stems and leaves sufficiently, then mash until smooth and squeeze the extract. Then use the juice of herbal as an ear drops. Perform this treatment regularly so that earache can be resolved. 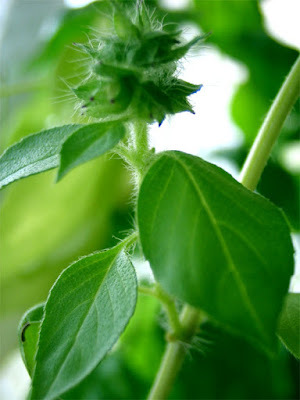 Lemon Basil leaf is one of the leaves that can be used to treat a watery ears, this plant are relatively safe and have no side effects when it given to children. Take 5 leaves of lemon basil, wash and smash. Squeeze the pasta and take the juice for use as ear drops by using a pipette. 10 sheets of soursop leaf and 3 pieces of whole mangosteen skin, boiled simultaneously to boiling. Let the water cooling, then drunk 2 times a day regularly. This herbal is a method of healing the ears from the inner body. Miana leaves, galangal and sambiloto leaves can be used simultaneously and then take the juice by squeezing it using a thin and sterile cloth. Then use the juice of herbal as an ear drops. This herbal treatment is proven can quickly dry the wound in the ear cavity and stop the problem.